The original VAMP Mark II was sold in stores from 1984-1985 and included Clutch v2 (AKA Tan Clutch). 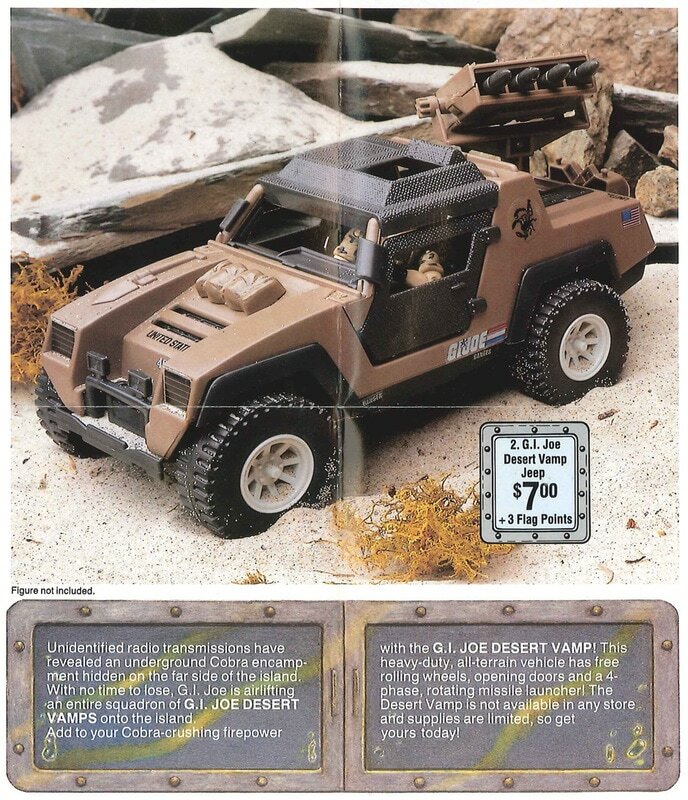 The same VAMP Mark II was reportedly re-released via mail order in 1988 (see the "Operation Deep Six" and "Operation Blackout" offers) and did not include Clutch v2. 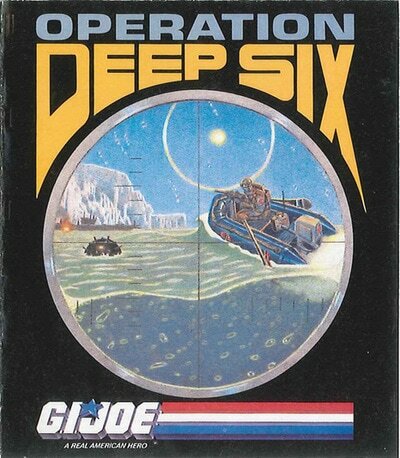 1988 "Operation Deep Six" offer cover. 1988 "Operation Deep Six" offer. 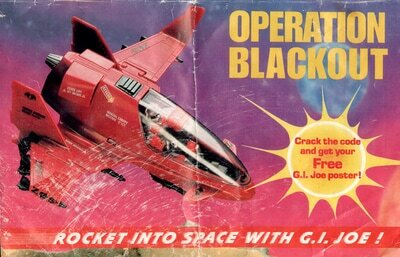 1988 "Operation Blackout" offer cover. 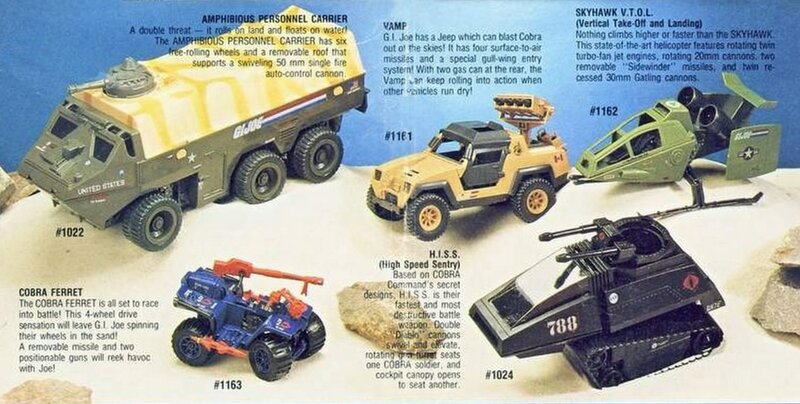 1988 "Operation Blackout" offer. 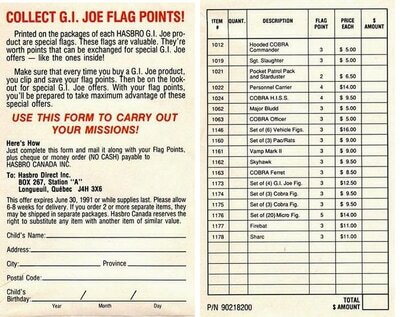 I remember ordering from this offer, so I don't have the order form. 1991 Canadian "Premium Offer Booklet"
Years later Hasbro produced a light tan VAMP Mark II that was ​based on the 1989 Tiger Sting. 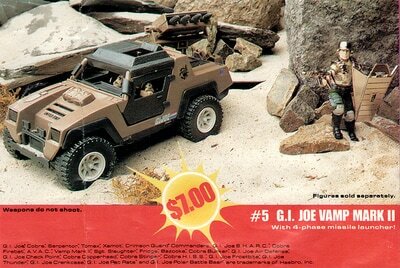 This version features a VAMP Mark I body and a modified VAMP Mark II missile launcher (adding tabs underneath). 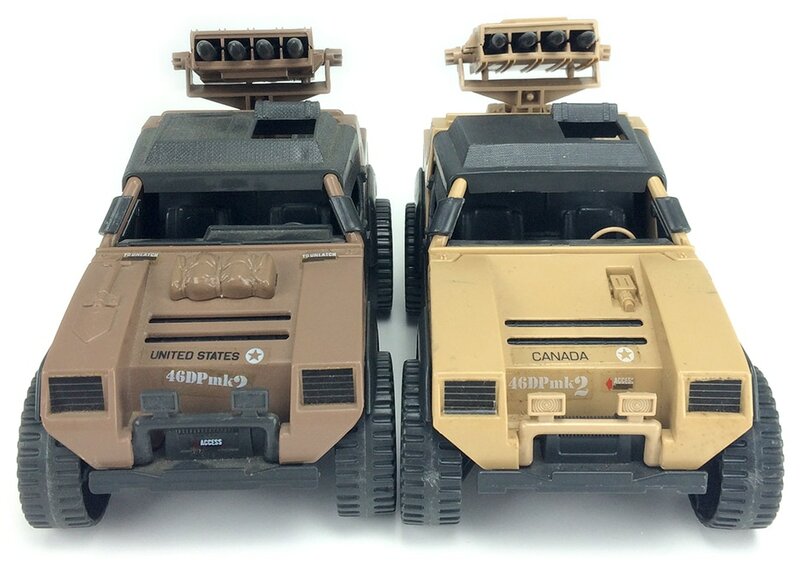 The Tiger Sting and the light tan version of the Vamp Mark II were manufactured in Brazil and dated 1988. 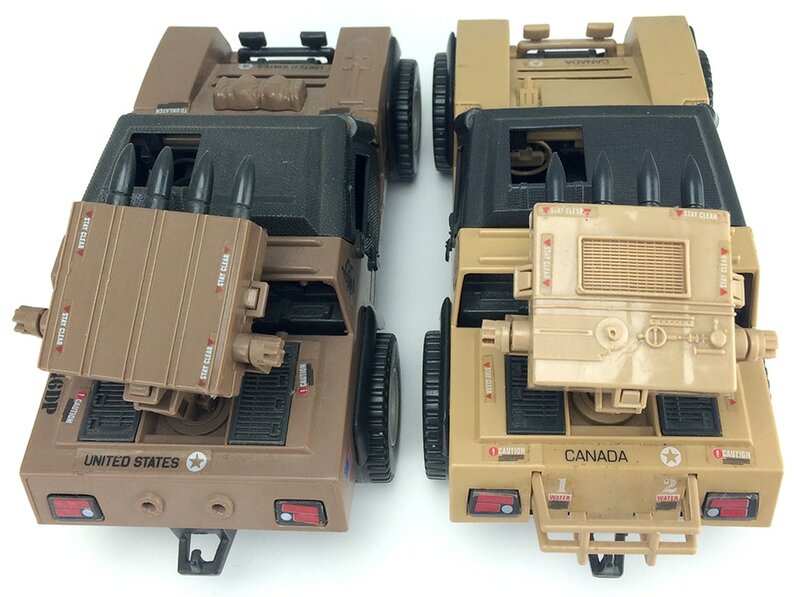 Some collectors believe that the light tan VAMP Mark II was produced solely by Hasbro Canada, Inc. for the Canadian market, and hit the US market in 1993 at the annual convention after Hasbro Canada, Inc. shuttered their operations. 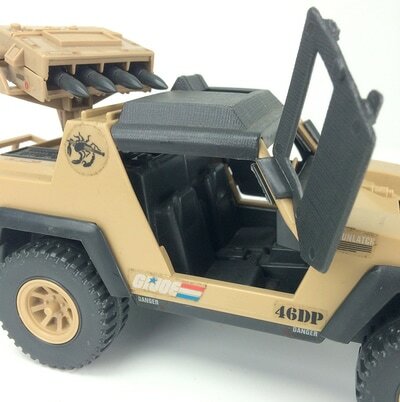 One reputable collector has reported seeing a sealed light tan Vamp Mark II with US stickers and blueprints. We have not confirmed. Have a sealed US specimen? Let us know! There are many differences between the original VAMP Mark II and the light tan VAMP Mark II, most notably the color. 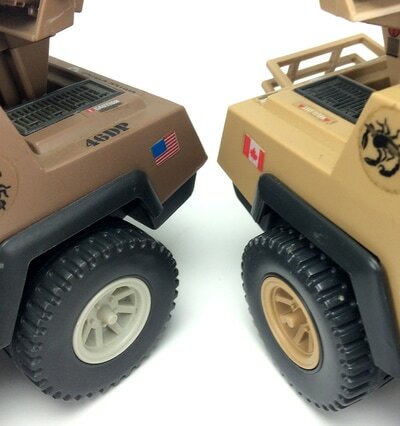 See the image gallery below for a detailed comparison of these vehicles. Roll over the images below to find out more, or click to enlarge them. 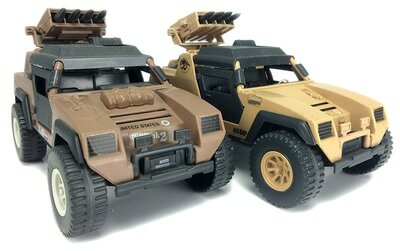 The retail release of the VAMP Mark II is pictured on the left, while the mail order version is pictured on the right. 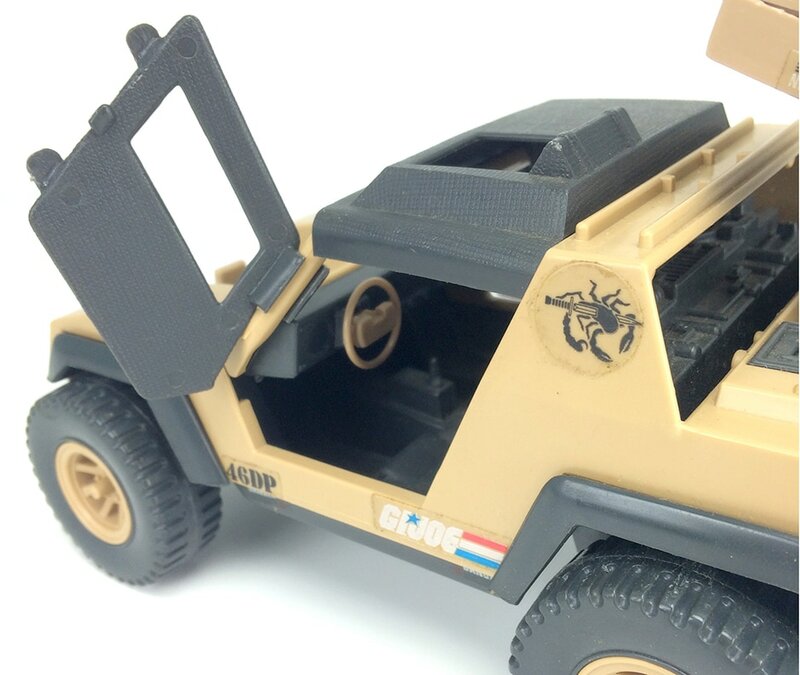 The main body of the mail order version is a much lighter shade of tan, with the molded details more closely matching the VAMP Mark I. Another significant difference is the presence of Canadian flags and labels on the mail order version. No samples of the mail order version are known to exist with United States labels. 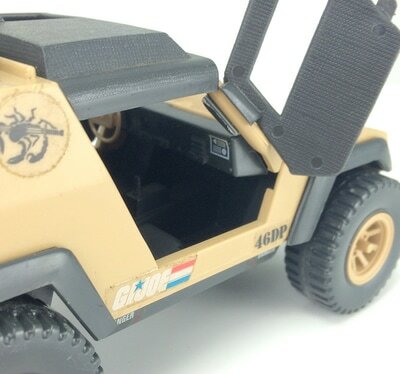 As with the body details on the front of the vehicle, the mail order version uses the water can bracket and the water cans from the VAMP Mark I (note: the Mark I blueprints and box refer to these as gas cans). 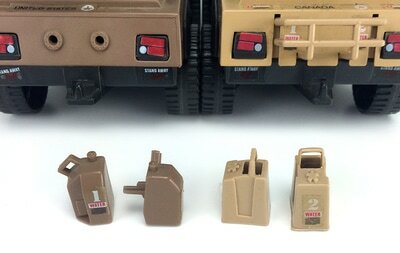 Comparison of the water cans and the molding differences on the rear section. 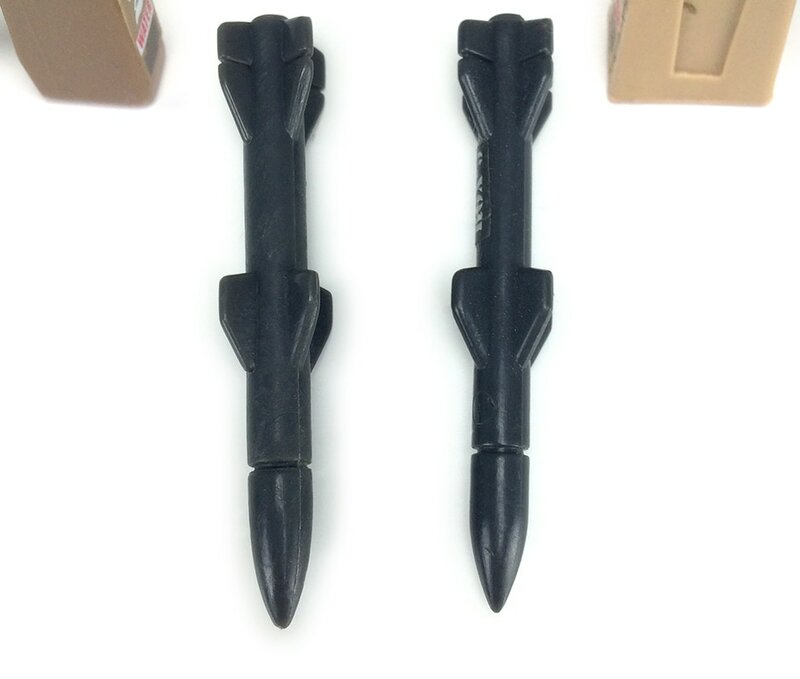 The documented orientation of the missile rack piece differs between the versions, as the mail order piece attaches with the sculpted detail on top, whereas the sculpted detail is on the bottom of the retail release. 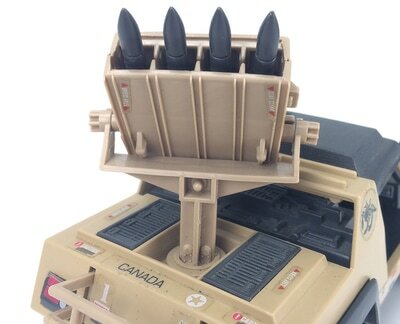 Another view of the missile racks. 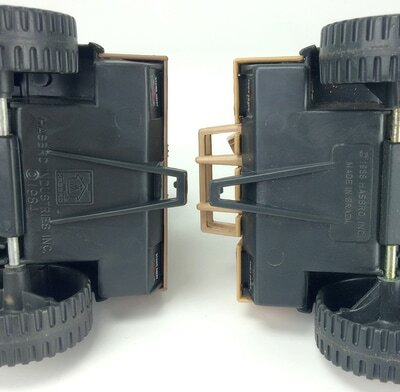 Note that the mail order version has a tab on each side of the bottom, presumably to more easily allow the rack to remain in an elevated position. A closer view of the two new tabs that have been added to the bottom of the missile rack. 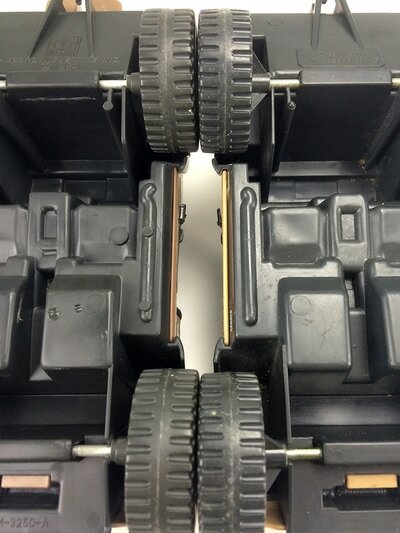 The presence of these tabs allow the rack to be vertically oriented such that the sculpted detail can be seen while still allowing the rack to be positioned upward at an angle. Note: these tabs also appear on the 1989 Tiger Sting. 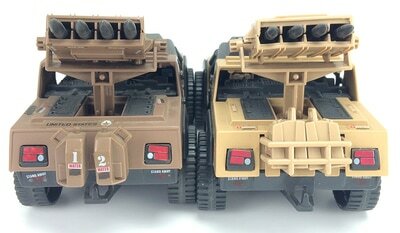 A comparison of the Stinger XK2 missiles between the two versions. Unlike the main body, the mail order version's missiles are a slightly darker color than the retail version's missiles. A side view of the interior. 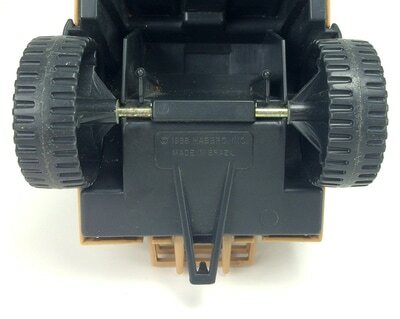 A better view of the steering wheel. A view of the dashboard on the passenger side. 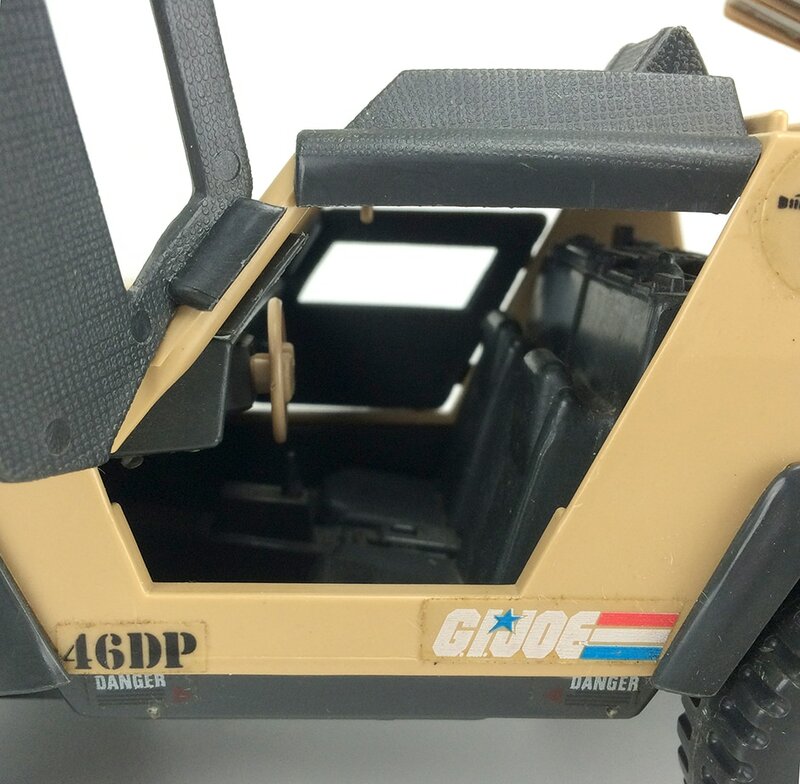 Another view of the interior, this time on the passenger side. 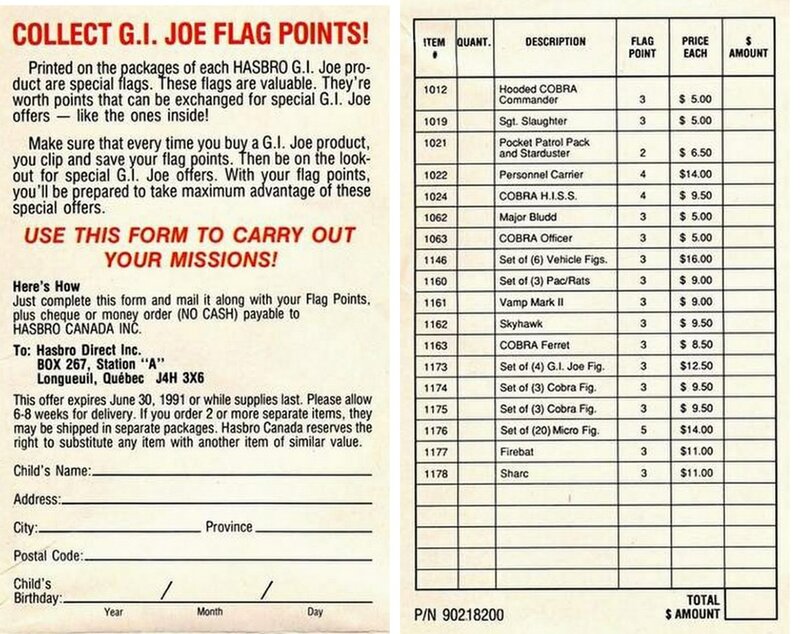 A comparison of flag labels on the two versions. 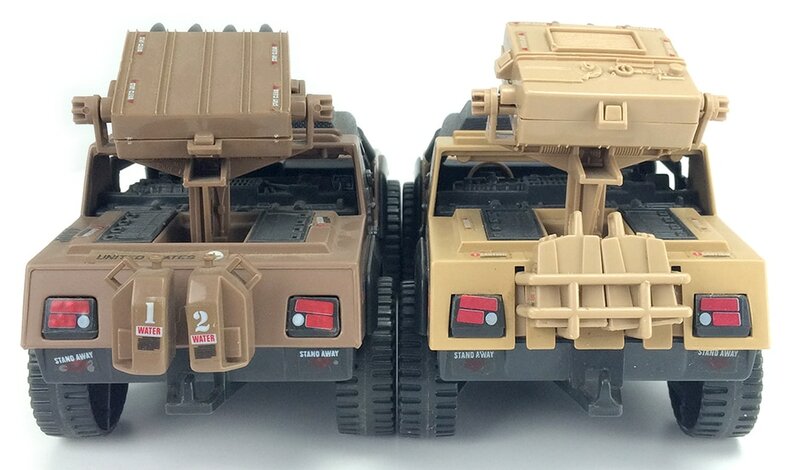 A comparison of the tow hooks between the two versions. 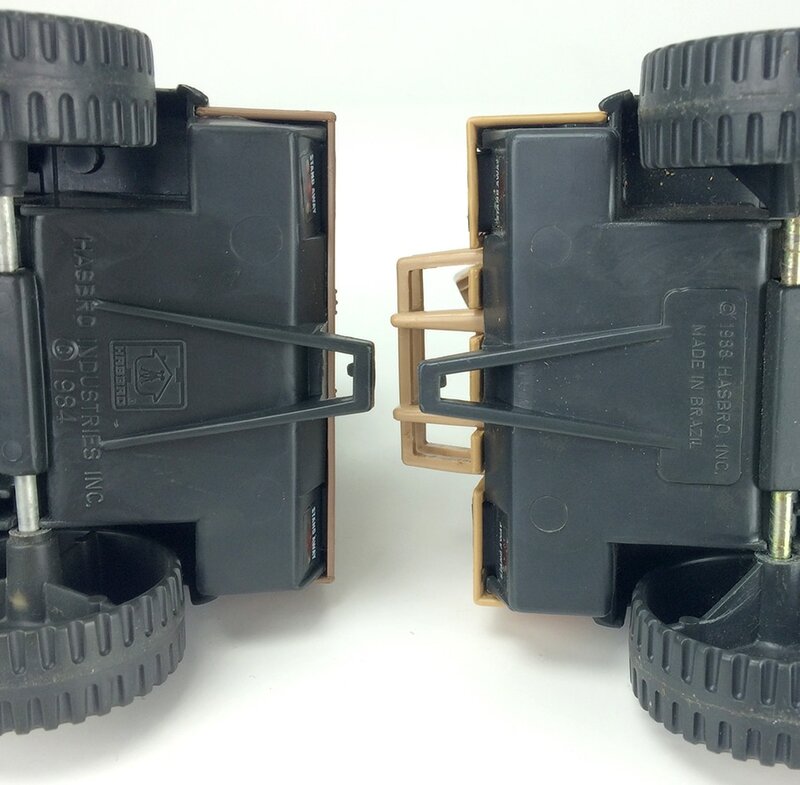 The mail order version has a hook frame that is longer and more narrow. Copyright information indicates that this vehicle was manufactured in Brazil (by Estrela, which distributed G.I. Joe toys in the country for many years). 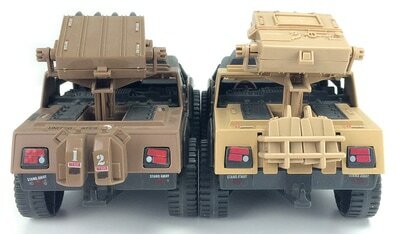 A comparison of the underside of each vehicle. Note the tabs on the side of the retail version, the serial number information near the front of the retail version, the smaller center indentation with a rounded top, the flat-ended cylinder compared to the rounded end on the mail order version, and the difference both in the text and the orientation of the copyright information. 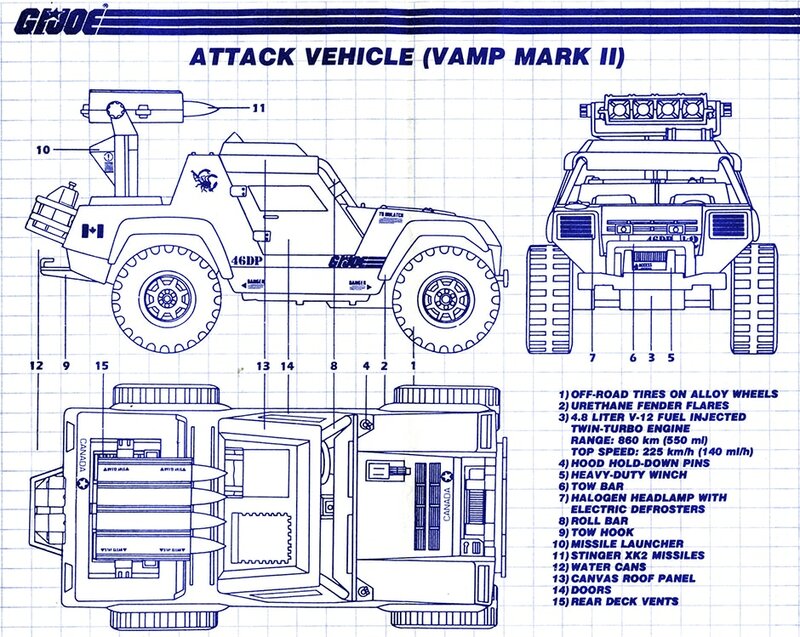 VAMP Mark II (mail order) blueprint/instructions courtesy of Tim Dz. Note: the VAMP Mark II blueprints above were produced by Hasbro Canada, Inc. in Québec and feature the Canadian flag and markings. 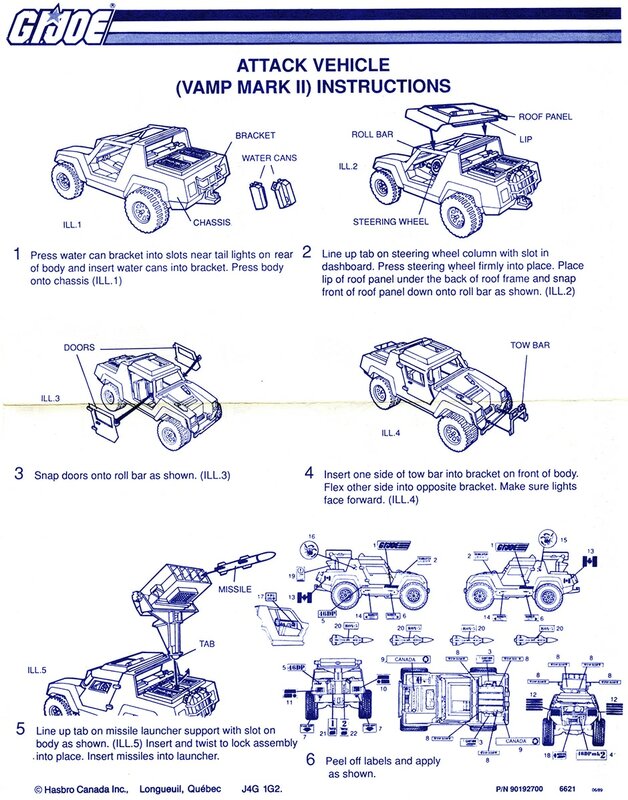 These blueprints came with the light tan version of the VAMP Mark II. Have the same instructions but showing US markings? Let us know!